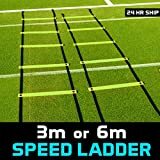 The speed ladder is a popular piece of equipment for circuit and fitness training throughout all sports. Used for improving mobility through stride technique, coordination, arm control and speed. Fully adjustable, highly visible rungs, to vary feet speed. Attachable ends allow you to join ladders for a greater challenge or to vary activities and drills. Speed ladders are the ideal training aid, to improve coordination, reactions and speed. As well as the mobility benefits, these ladders are also a useful fitness tool. Unlike some speed ladders, they have professional flat rungs, which reduce the risk for injuries whilst maintaining the required challenge. Additionally, the rungs are fully adjustable, to vary feet speed; all you need to do is slide them along the edges. Depending on your requirements, both 3m and 6m ladders are available. Additional ladders can also be attached to increase the length and challenge. – Ladder lengths: 3m & 6m. – Hi-Viz flat rungs, fully adjustable. – Attachable ends to join ladders.